At Testa & Sons Signs, we provide businesses in and around Pembroke Pines with professional custom signs for both indoor and outdoor use. Regardless of the size of your project, Testa & Sons Signs can provide an exceptional product for you to help highlight your business. For the best custom signs for businesses and communities, turn to Testa & Sons. We are meticulous in manufacturing your personal sign design in Pembroke Pines. We work hard to make your idea reality. Whether you need interior signage to personalize your office or you need to get approved street signs up, you can trust in Testa & Sons to get the job done. 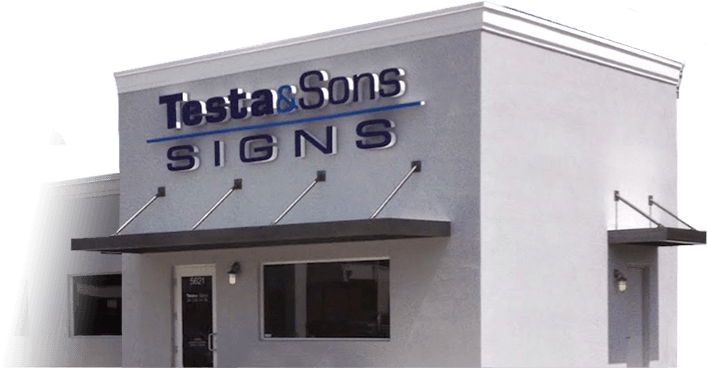 Specializing in business sign installation and design, Testa Sons & Signs offers a great option for those searching for business signs Pembroke Pines. Regardless the size of your business in Pembroke Pines, any business can benefit from having a professional designed business sign and having that sign installed by professionals, like Testa & Sons Signs. We treat every business sign project as it was our own and pay attention to every single detail in the creation of your sign. When it comes to installation of your business sign, we will work closely with your property manager or other official in order to make sure that your business sign is installed professionally and in the correct way. For services regarding signs, including sign design, sign installation, and sign removal, you can contact Testa & Sons. We are committed to providing the sign service you need in excellence. Give Testa & Sons a call today and speak to one of our experienced professionals!